Jimmy Sheridan (top, far left) of William’s was one of two guides who took Leadership Wyoming team members (continuing from left) Ben Zeidner, Rick Hiduk, Brad Georgetti, Kimberly DeLeo, Mike Gomez, Justin Kostelanski, Kelly Langan, Alisa Shaffer, Bonnie Nemergut, Phillip McKeon, Diana Petlock, and Matt Swartwood on a tour of a William’s compressor station in Susquehanna County on Nov. 15. Assisting at host sites on Leadership Wyoming’s “Gas Day” were (above, from left) Cabot Oil & Gas external affairs coordinator Bill desRosiers, team adviser Atty. Jami Layaou Hearn, and SWN community relations manager Michael Narcavage. 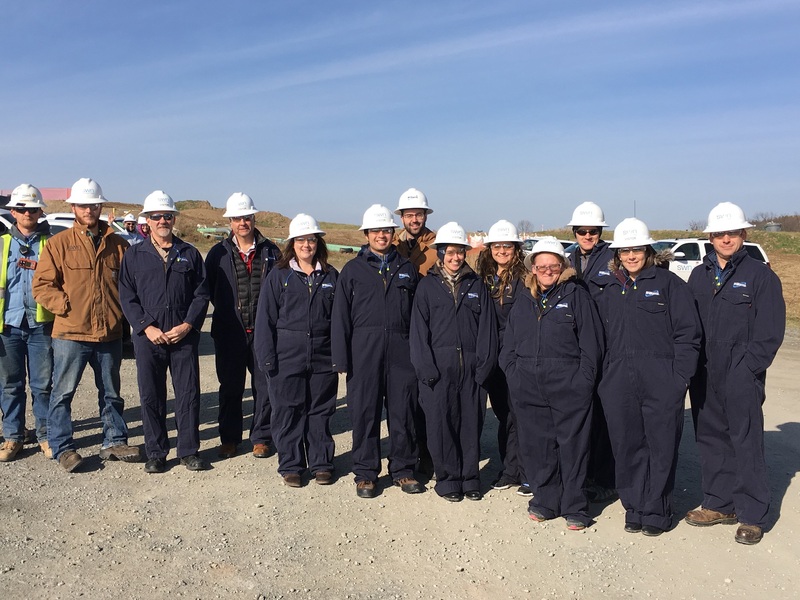 “Natural Gas Day” for the Leadership Wyoming team was punctuated by tours to three active sites in nearby Susquehanna County and presentations by leaders in the natural gas industry. Group members donned hardhats and overalls to get a closeup look at a drilling rig and heard a firsthand account from a UGI official, just a day after a million dollar grant was awarded to the Wyoming County Chamber of Commerce to facilitate the company in bringing natural gas service to Tunkhannock. Southwestern Energy and Tioga Environmental Consulting, LLC sponsored the day’s events. 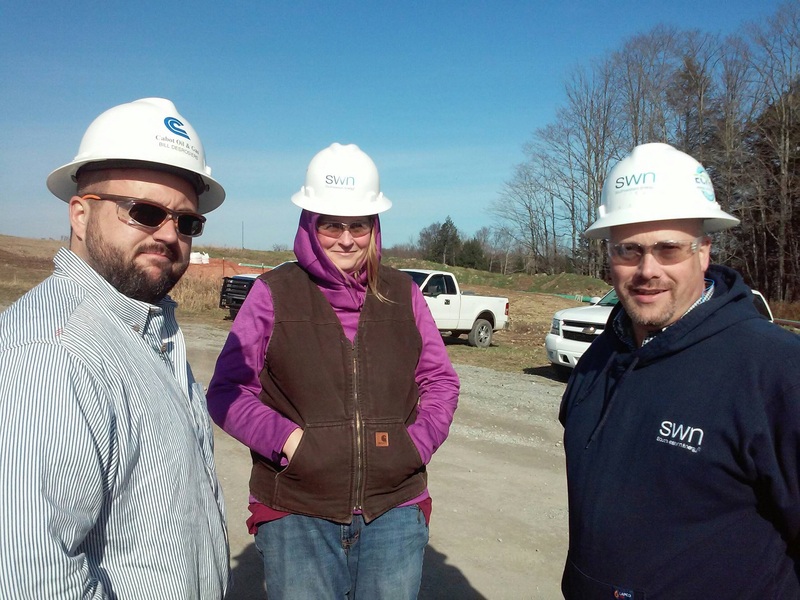 SWN’s Michael Narcavage, Bill desRosiers of Cabot Oil & Gas, and Mike Atchie of Williams oversaw the tours. The hands-on summary of what is involved in getting natural gas from the Marcellus shale and processing the raw material for the open market was capped off by a presentation from UGI Penn Natural Gas director of business development Don Brominski, who detailed the complexity of making the product available to new customers. “The entire day was an exciting learning experience,” Alisa Shaffer related. “I never realized how many different steps there were towards getting the gas and how many companies and employees it takes to make sure it’s done right.” Shaffer works in Atty. Jami Layaou Hearn’s office and was one of a majority of Leadership members who doesn’t routinely experience the ins and outs of the gas industry. Ben Zeidner of SWN and Justin Kostelansky of Williams, on the other hand, are two team members who already work directly in the gas fields. Matt Swartwood conducts inspections in and around gas sites as an employee of Borton-Lawson Engineering. And Phillip McKeon of Endless Mountains Events, a partner of BX3 Oilfield Supply, often coordinates the rental of heavy equipment used in the gas industry. 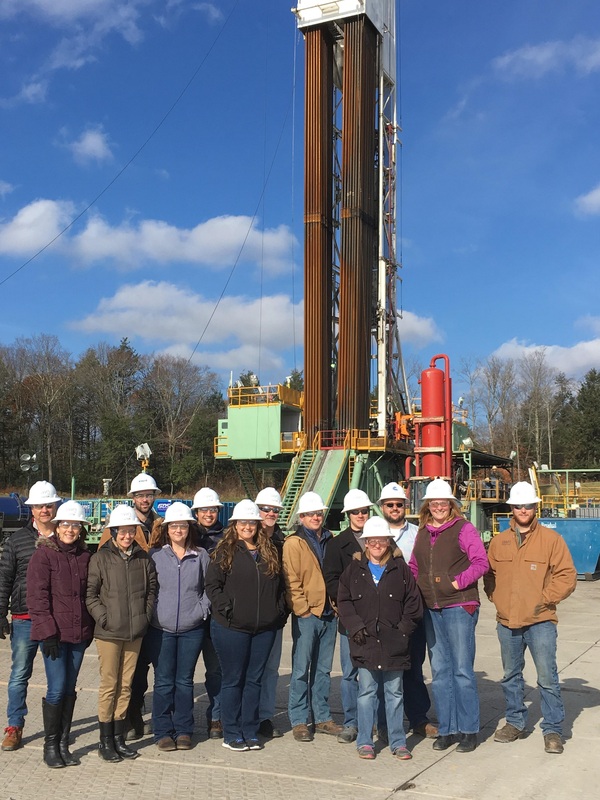 “It is impressive to see that most, if not all companies in this industry seem to have the same focus in mind – the safety of their employees, the impact on the environment, and the understanding that they are guests in the communities that they serve,” said Zeidner. Swartwood was impressed by Williams’ effectiveness in reducing the noise impact of their compressor stations. Brominski’s overview of potential use of natural gas here at home also resonated with him. “The discussion with UGI reinforced the importance of making natural gas available in Wyoming County in attracting new businesses and industries,” Swartwood stated. Eight Leadership members participated in a tour of labs and classrooms at Tunkhannock Area High School on Nov. 13 in an attempt to better visualize where a planned career fair will take place in May and also to narrow the scope of the event to make it both relevant to participants and supportive of the school’s curriculum. Seeing how many state-certified courses the district already has in place or at-the-ready changed the perspective of group members as to whom the career fair should target and the messages to be conveyed. It was decided that the career fair should be conducted for seventh- through ninth-graders to show them the variety of paths and courses that can adequately prepare them for internships, trade schools, and college. Tunkhannock High School Principal Greg Ellsworth noted that the district has the capability of expanding studies in agriculture, graphic arts, robotics, auto mechanics, business, food services, early childhood development and media skills if enough students commit to those courses of study. The Leadership team will now focus on a specific date and time for the event before approaching area businesses, schools, and other recruitment sources to solicit representatives for the career fair. At the suggestion of TAHS School to Work Coordinator John Shaffer, planners will also devise some sort of assignment for students to complete in the course of the fair to quantify their participation. Leadership Wyoming is sponsored by the Wyoming County Chamber of Commerce. Touring the Teddick gas pad near Kingsley on Nov. 15 were Leadership Wyoming team members (above, from left) Brad Georgetti, Diana Petlock, Kelly Langan, Justin Kostelansky, Kimberly DeLeo, Mike Gomez, Alisa Shaffer, Rick Hiduk, Matt Swartwood, Phillip McKeon, and Bonnie Nemergut, Cabot external affairs coordinator Bill desRosiers, team adviser Jami Layaou Hearn, and team member Ben Zeidner.